Janet Haggard is the designated broker for SEI Real Estate Professionals in Snowflake, AZ. She has been involved in real estate in the White Mountains since 1997. She received her Broker’s license in 1999 and the GRI designation in 2002. Janet feels that the best part of the real estate business is meeting people from many different backgrounds and different parts of the country. Janet grew up in Tucson where she attended high school and the U of A majoring in business. 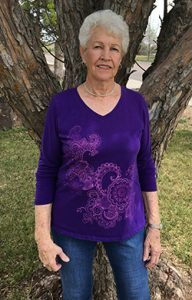 After raising a family and spending many years in the Chandler area she moved to the beautiful White Mountains where she was able to enjoy the area’s relaxed atmosphere and friendly people. Besides real estate, Janet loves animals and spends time caring for her two horses and dogs at a small ranch in the country. Janet also enjoys outdoor activities, spending free time gardening and camping. Janet also enjoys visiting kids and grandkids who live in the Valley, which is another favorite pastime.